More people and businesses than ever are learning about the Roanoke Region thanks to roanoke.org. 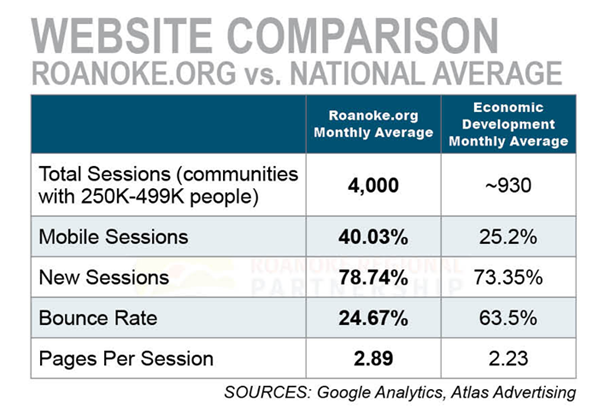 The Roanoke Regional Partnership’s website is ahead of the curve when it comes to attracting visitors to showcase information about the region. In a recent audit with Atlas Advertising, a national firm that specializes in economic development websites, the Partnership’s website was ahead of the industry in most benchmarks. More than 78 percent of the sessions each month are new, meaning that people who did not come to the site in the past 30 days are visiting. That’s a good sign, because more people are accessing the information available. The bounce rate – how many users come to the website and immediately leave – is well below the industry average at less than 25 percent. Comparable websites have an average bounce rate of more than 63 percent. Users look at 2.89 pages per session. That means users are finding relevant information about the region and looking for even more. One of the Partnership’s most viewed pages includes contact information, turning website visitors into potential prospects or services. Content marketing is an important part of the Partnership’s online strategy to help people learn more about the region. The web is the first place people go to look for information, including site selectors and decision-makers evaluating new locations.